Cloud computing and SaaS are rapidly being embraced by IT organizations worldwide as benefits in operational cost, capital cost, IT agility, and infrastructure reliability are being realized by these organizations. 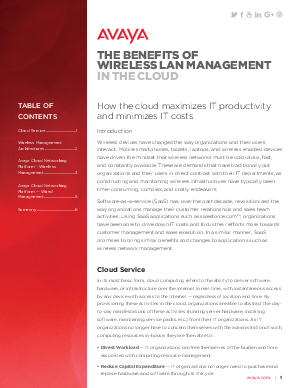 Indeed, many organizations have shifted future IT spending to reflect a larger balance of cloud technologies vs. on-premise technologies. Avaya recognizes the efficiencies that the cloud can bring organizations. The Avaya Cloud Networking Platform simplifies wireless and wired deployments allowing organizations to easily manage, control and secure their network anytime, anywhere. This allows them to focus on what they do best – serving their core customers and constituencies, not manage IT infrastructure.